Pro-Grow soil conditioner produces a much healthier soil, bringing about healthier vegetation and higher growth rates. Dig a hole and mix in the ratio of 1 spadeful of PRO-GROW™ to 3 spadefuls of soil, place plant in position, fill in with the mixed soil and water immediately. Dig a hole and mix in the ratio of 1 spadeful of PRO-GROW™ with 2 spades of soil, place tree or shrub in position, fill in with the mixed soil and water immediately. 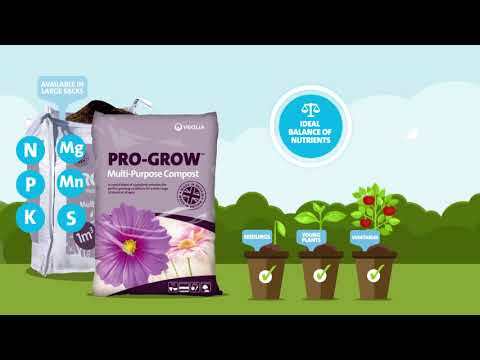 For potting always mix 1 handful of PRO-GROW™ to 3 handfuls of soil or peat. Prepare seed beds and rake 2 spadefuls of PRO-GROW™ per square metre into the top 5-7 cm (2-3") of the soil. Prepare seed trough and seed accordingly before covering with the treated soil. Apply 5-7 cm (2-3") of PRO-GROW™ to the surface of the soil and fork into the top 15cm (6") of the soil. Plant seed or flowers as normal. Every effort has been made to ensure this compost contains no germs, sharp fragments, toxins or regenerative plant parts. However, the compost producer cannot guarantee they will never be present. As with all products of this type, wear gloves when handling and wash hands after use. During handling avoid inhaling any dust or water vapour or droplets from it, or ingesting any of it. This product should be kept in a dry and cool place covered from wind-blown weeds and other contaminants. Order online and get Pro-Grow delivered to your home. Pro-Grow 30L bags are delivered within 5 - 7 working days. In order to give you the best possible value for money, orders of any more than 6 bags will be delivered on a pallet. Pallets are delivered on a 7.5t vehicle and unloaded using a pallet trolley. If you order more than 6 bags of Pro-Grow 30L then you will need good access for a 7.5t vehicle and please be aware that the pallet trolley cannot travel across un-even surfaces (e.g. gravel). We will try our best to put the pallet where you need it but WE MAY ONLY BE ABLE TO DELIVER IT TO THE KERBSIDE. If you live in a countryside lane please mention on the checkout 'delivery instructions'. "Thought long and hard before ordering, so pleased that I did, very pleased with the soil and bark I received, will be ordering again, so much easier having it delivered than buying from the garden centre"
"Easy to order, delivered to the gate in bags easy to carry. Product pleasant to handle, peat-free and easy to spread. Next Spring will tell us how effective it is!" "The product is excellent and has improved plant growth. My only concern was that the pallet could not be lifted down my drive because the jack had very low lifting capacity. I wouls imagine that pallet loads would be bought in rural areas and come up against gravel drives." "With the assistance of your very helpful customer service team regarding delivery, the order was delivered in good condition and in good time. "